‘Pré Catelan’ refers to the restaurant in the Bois de Boulogne famous for its lavish Belle Époque interiors. Its attractive gardens made it a favored meeting place on summer evenings. This unlined coat of chiffon-weight lame would have contributed to a spectacular entrance. As worn by Denise Poiret, the coat's unstructured form would have been draped with a casual insouciance. For all its shawl-like formlessness, however, the coat is of ingenious construction. 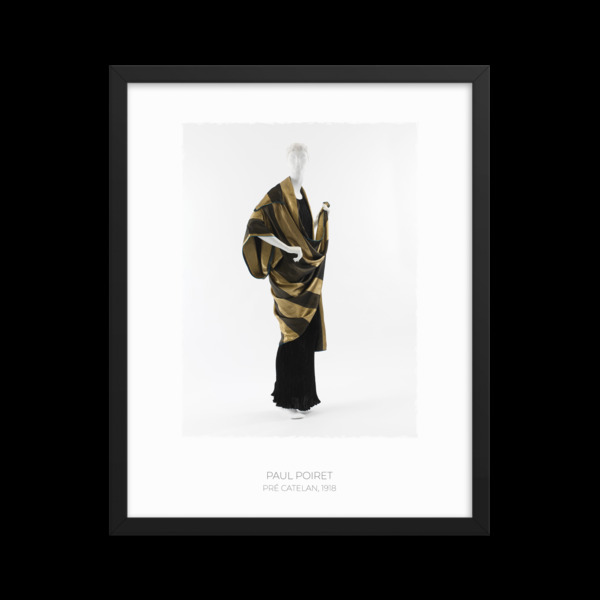 Poiret finesses the challenge of the bold striping by cutting the body and stole collar in one. While the sleeves are separate rectangular pieces, the body and draped neckline of the design are constructed, origami­like, in one continuous section. The slight cocooning arch of the back is created by the shirring of the pattern piece as it meets its own edge, forming a seam. It is not until the work of Alix Grès in the 1930s and Issey Miyake in the 1970s that similar sculptural effects based on such deliberately and radically reductive cuts executed on the straight grain reappear.